In the last two months, Kazakhstan has faced a wave of protests, followed by violent attacks that have left at least 19 people dead. While these events–the Land Code protests and the Aktobe attacks–are not related (at least they do not appear to be related at this juncture), together they nonetheless feed a fearful mood. With the authorities claiming the protests were a coup attempt and the Aktobe attacks were the work of extremists, it’s surprising Kazakh President Nursulan Nazarbayev hasn’t said a word. In late January, Kazakh police detained a prominent, pro-Russian businessman in Shymkent, a city in southern Kazakhstan. The authorities said firearms and narcotics were found in his home but there was little information at the time made public about the charges against him. Monday, Kazakh prosecutors and national security officials cleared it up: Tokhtar Tuleshov stands accused of attempting to stage a coup, in particular inspiring and financing the recent Land Code protests. The businessman, best known for running one of the country’s largest breweries, is accused by the state of leading and financing organized crime, illegal drug possession, kidnapping and murder, to name a few of the crimes announced at a press conference Monday. Tuleshov, according to spokesman for the National Security Committee (KNB) Ruslan Karasev, began plotting last December. “The protests were to take place a little earlier,” Karasev said, but Tuleshov’s arrest forced a change of plans. Karasev said Tuleshov sought allies among current and former law enforcement officials. Five have been detained as co-conspirators: a former deputy prosecutor, a former police chief and deputy police chief from South Kazakhstan, and two southern military command lieutenants. Protests began popping up across Kazakhstan–in nearly every major city–in late April. Organizers planned nationwide protests for May 21, but were headed off by the authorities. In the week ahead of May 21, police detained a handful of organizers and when the day of the protests arrived blocked major public squares and rounded up anyone who looked like they were on their way to the protests. Most of those detained were released quickly but some still face the possibility of serious charges. As the protest mood bubbled, some Kazakh media outlets sought to link the protests to outside instigators. In one particularly memorable broadcast detailed by Bruce Pannier, First Channel Eurasia’s Analitika program showed a 25 second clip on loop alleging to show money changing hands, hundred dollar bills hanging out of pockets. Kazakh prosecutors have called the protests an attempt to stage a coup. While Kazakh authorities were laying out their charges against Tuleshov on Monday, the northern Kazakh city of Aktobe was still on lockdown following attacks Sunday on two gun shops and a National Guard base that resulted in at least 19 deaths. Very little is known about what happened in Aktobe, specifically who perpetrated the attacks and why. The authorities have pinned the attacks on followers of “nontraditional religious movements,” a euphemism for Islamic extremists and it appears, from local media reports, that the perpetrators were locals. To recap: In the last month, according to the Kazakh authorities, there has been an attempted coup and a terrorist attack. President Nursultan Nazarbayev responded to the initial Land Code protests, punting the offending Land Code changes into 2017 and setting up a commission. But when it came to the rash of arrests leading up to and on the day of the May 21 protests, there was silence. 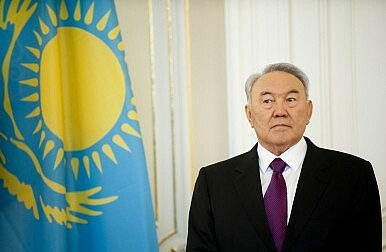 Following the Aktobe attacks, Nazarbayev has also remained silent. The silence is baffling, to say the least. Aigerim Toleukhanova reported for EurasiaNet that nearly a full day passed before a top-level member of the Kazakh government made a statement of any kind. And the statement was lacking. Prime Minister Karim Masimov told a June 6 cabinet meeting “The head of the state is maintaining this issue under his control.” That’s unlikely to be terribly reassuring.